First off, I loved “Walk the Dinosaur”. George Clinton was the man, nuff said! So props to Amy’s for their retro attitude. However, I ABHOR wasting food. The only good place for spaghetti and meatballs is in my belly. Final straw indeed. 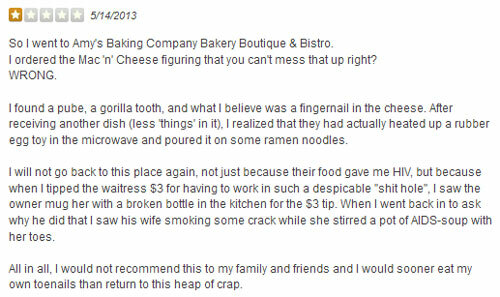 Hilarious Yelp Review #4 – Unhygienic Man Apes work the Kitchen at Amy’s. Personally I’m very equal-opportunity when it comes to having man apes in the kitchen. I bet they go through a TON of hair nets though. The fingernail and tooth though is a little much. 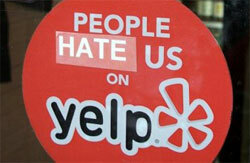 Sounds like they would probably lose their “A” quality rating, at least here in San Diego. Maybe standards are a little less exacting in Scottsdale? 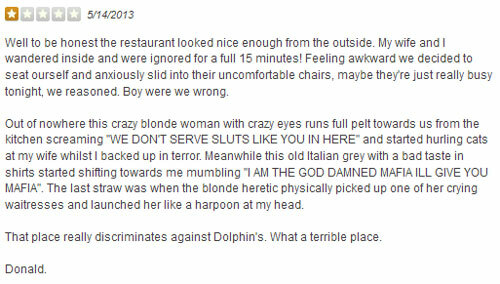 Hilarious Yelp Review #5 – Don’t Order the Pizza. It will LITERALLY kill you! You know what I don’t want as an after-effect of my pizza? Cancer! Ouch. Poor Amy’s can’t even get its staple pizza right. 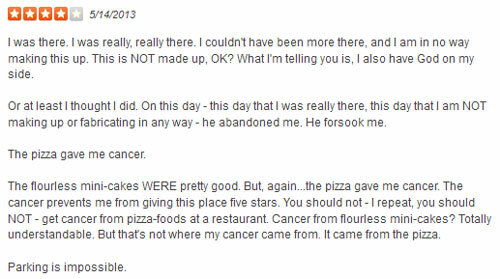 Now the reviewer didn’t elaborate on what kind of cancer he did get but if I had to choose which to correct, the carcinogens in their pizza crust or their parking…I’m probably going with the pizza crust. But it would be close. Now, it goes without saying that some (okay probably all) of these reviews are most likely fabricated. But then again…do you REALLY want to risk eating that pizza or having a man-ape serve you your food? Let us know in the comments below.